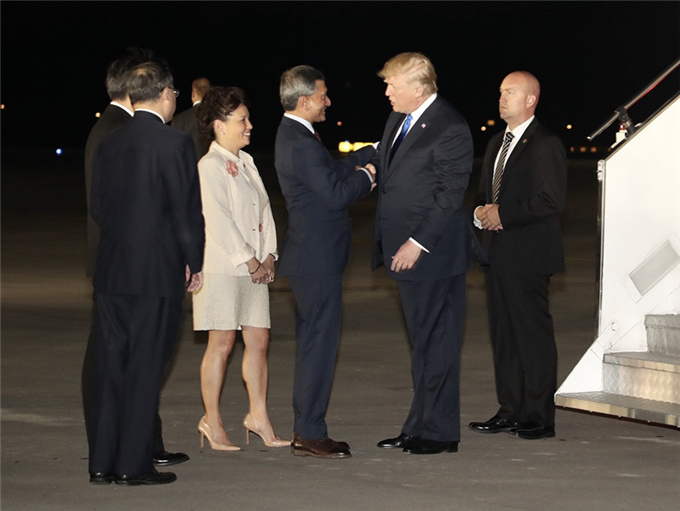 US President Donald Trump arrived in Singapore on Sunday amid great optimism about Tuesday's summit with Democratic People's Republic of Korea top leader Kim Jong-un on improving ties and ultimately achieving the denuclearization of the Korean Peninsula. 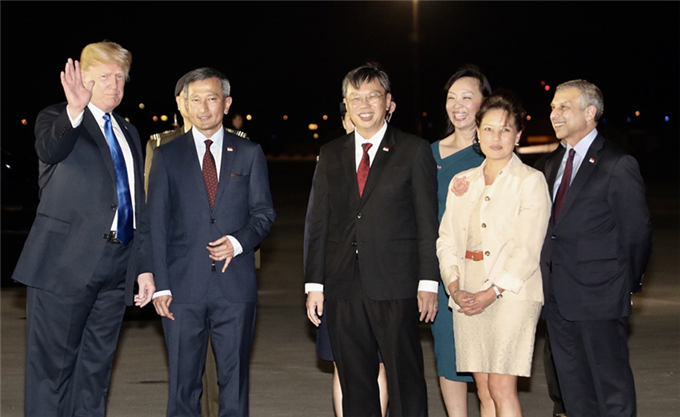 Trump's Air Force One landed at Singapore's Paya Lebar Air Base on Sunday evening about six hours after Kim's arrival at Changi Airport. "We have to get denuclearization. We have to get something going," Trump told the media shortly before departing for Singapore from Charlevoix, Canada, where he attended the G7 summit and clashed with leaders of the six other nations over additional US steel and aluminum tariffs. He said, "We appreciate everything that's going on", adding "we appreciate working together" with the DPRK. "They're really working very well with us." The optimism and confidence is a big contrast to just months ago when Trump and Kim engaged in a war of words, including trading personal insults. On May 24, Trump abruptly canceled the June 12 summit, but revived it eight days later. Tuesday's summit will be the first meeting between a sitting US president and a top DPRK leader. Trump said: "This is a great opportunity for peace, and lasting peace, and prosperity. "So we're going in with a very positive attitude, and I think we're going to come out fine." But he cautioned that there's a good chance it won't work out. "There's probably an even better chance that it will take a period of time. It will be a process," he said. The US president has in the past week tamped down the previous high expectations of a rapid complete, verifiable and irreversible denuclearization on the part of the DPRK. He has since described the first summit as a get-to-know-you meeting, and that denuclearization will take many meetings. "I think the minimum would be a relationship. You'd start at least with a dialogue," Trump said. 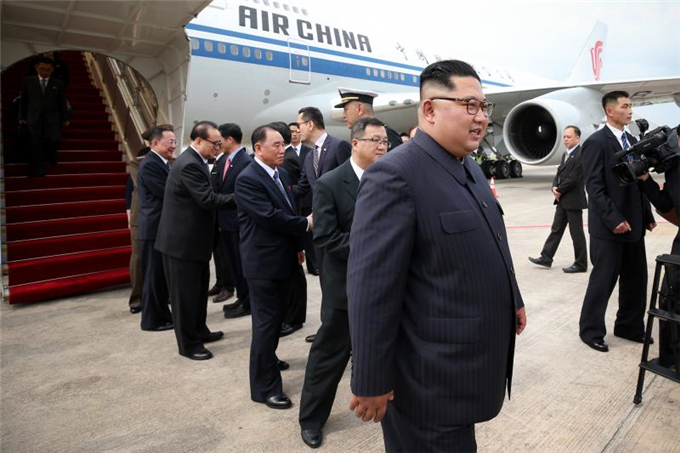 Kim did not make public statement before or after his arrival in Singapore. 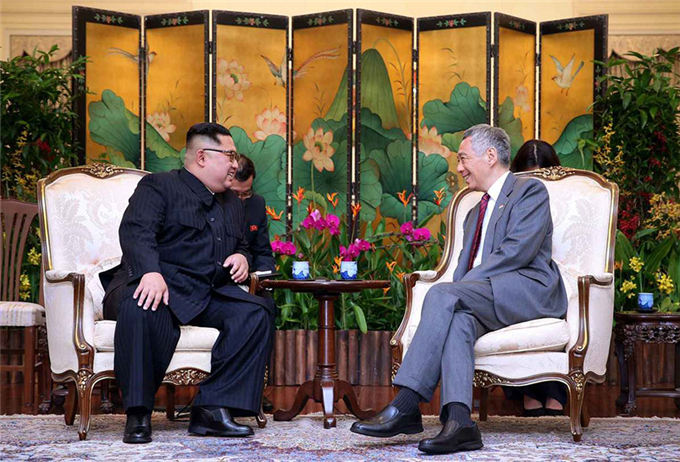 He met Singaporean Prime Minister Lee Hsien Loong on Sunday evening. Trump will meet Lee on Monday. 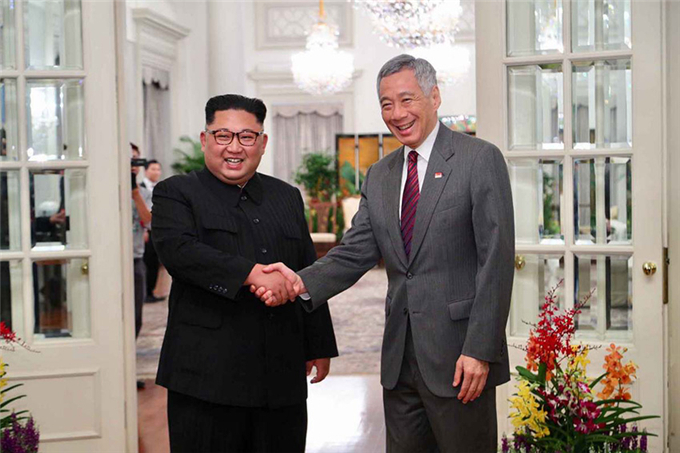 Singapore has diplomatic relations with both the US and the DPRK. Tuesday's summit between Trump and Kim will start at 9 am local time at the Capella Hotel on Sentosa, a resort island off Singapore's southern coast linked by a causeway and cable car. Singaporean newspaper The Straits Times reported that around 3,000 reporters have arrived in Singapore to cover the historic summit. While White House accredited reporters have a media center at the JW Marriott Hotel, the Singapore Formula One building has been turned into a temporary media center for mostly international journalists. Security has been extremely tight. Singaporean authorities have imposed traffic restrictions for the summit. Taxis are not allowed to go close to the Shangri-La or St Regis, where Trump and Kim stay, respectively. Shen Dingli, a professor at the Institute of International Studies of Fudan University, said the two sides could possibly affirm their collaborative commitment to denuclearizing the DPRK and possibly lay out their principles and the rough plan of a phased program. While the US has talked about the denuclearization of the DPRK, the DPRK often talks about the denuclearization of the Korean Peninsula and demands a post-denuclearization security guarantee and the lifting of economic sanctions. Chief among these include a peace treaty to formally end the Korean War, which is still in a state of truce after the 1953 armistice, a US troop withdrawal or reduction from the Republic of Korea, and a dramatic reduction of US-ROK joint military drills. Shen doubted the US would do anything to reduce troops or military drills, but he said it might offer some legally bound security assurance to the DPRK. Charles Armstrong, a professor of Korean Studies at Columbia University in New York, said it is not realistic to expect the DPRK to completely give up its nuclear program right away. He said the big question is whether the engagement can be sustained even if a major agreement is reached at the summit. "No one wants to return to the dangerous confrontation of last year, and it is possible that the talks will fail and the US will return to a policy of ‘maximum pressure'," he said, while the DPRK "returns to provocative actions". "There seems to be enough political will at the moment in Pyongyang, Seoul, Washington and Beijing to move the peace process forward, but there are many unforeseeable factors including especially domestic opposition in the US," Armstrong said. The US Republican and Democratic parties have pressured Trump not to make too many concessions in talks with Kim.